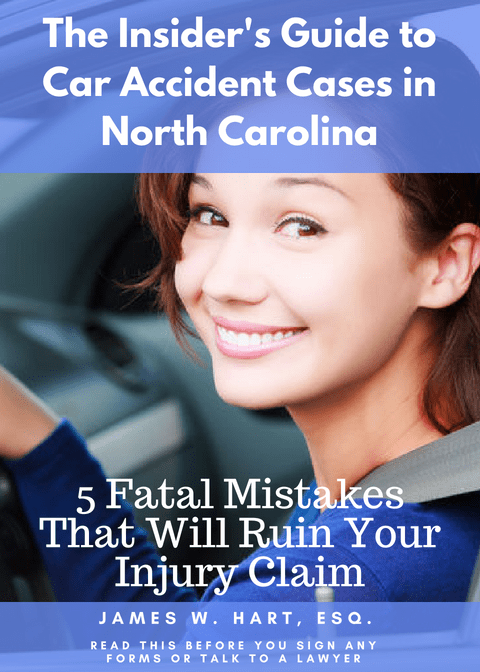 If you have been injured in an accident due to someone else’s negligence in North Carolina, you are probably wondering what most common types of compensation for personal injury cases are. As discussed previously in this guide, there are two primary ways that you can receive financial compensation if you have been injured. The first is to file a claim with the responsible parties insurance company, and/or your own insurance company, and the second is to file a lawsuit against the person or entity that you believe is responsible for your injuries. The physical, emotional, and financial harm you suffered are considered damages – more specifically, they are called compensatory damages because you can be compensated financially for the damages you suffered. Compensatory damages can be broken down further into special damages and general damages. Damages in general are meant to try to return you financially to where you were before the accident occurred. In other words, the purpose of paying you financial compensation is to make you as the injury victim “whole”. Just as it is important to understand how the law of negligence works so that you can properly prepare your personal injury case, you must have a firm grasp on the various types of damages that are available to you so that you know what to ask for from the insurance company. As personal injury lawyers, we are trained to maximize your settlement by asking for all available types of compensation. We are going to review each of these types of damages one at a time. This is probably the largest category of “special” damages that you will incur. Medical bills can include your hospital visit, separate bills from each and every doctor or practice that treats you, physical therapy, chiropractor visits, etc. These costs include not only the treatment you received that was related to the accident, but the treatment you will receive in the future as a result of the accident. Since your medical bills make up such a large portion of your special damages, you will need to keep careful records of every visit and every bill your receive. If you believe that your injuries will require future medical treatment and care, it is best to retain a personal injury to assist you in calculating the cost of your future medical bills. Frequently, the testimony of an expert witness will be required to review your injuries and calculate the cost of your future care. Out-of-pocket expenses include anything that you were required to pay out of your own pocket (not including medical bills) that were directly related to the accident. These items may include the cost of parking for medical visits, gas mileage (yes, you should keep a log), tolls, medical aids (such as crutches or a sling), the cost of a rental car, up-fits to your home or car (if required) and more. Every situation is unique and even though this list provides many of the more common out-of-pocket expenses you may incur, there could be others that we haven’t anticipated. Just like your medical bills, it is important that you keep a log of all of these expenses and document them with receipts. And also like medical expenses, these expenses may run well into the future and must be accounted for when seeking compensation from the insurance company. Lost income includes any wages or income that you lost while you were out of work as a result of your injuries. To measure lost income, you will calculate all of the income you lost from the day of the accident to the day of the calculation, as well as any future lost income or wages that you will lose as a result of the accident. To prove lost income, you may need to provide copies of your prior year tax returns and year to date paystubs. We also recommend that you gather a letter from your employer explaining how much time you lost from work as a result of the accident and how much income you stand to lost moving forward. You may also need a letter from your doctor explaining why you can’t work and when they anticipate you will be able to return, as well as any physical limitations that you may be under. If you are self-employed, calculating your lost income may be very difficult. This is especially true for independent contractors, small business owners, and part-time or seasonal workers whose income varies. If you need help calculating an appropriate amount of lost income, you should contact a personal injury lawyer for assistance. This is also true if your future earnings will be diminished permanently as a result of the accident. In these cases an expert witness may be required to prove your future lost income. Property damage typically includes the cost of damages to your vehicle if you were in an automobile accident. However, there may also be loss of personal property that was in the car with you, such as laptop computers, clothing, cell phones, jewelry, or property you were transporting at the time of the accident. If your vehicle was totaled as a result of the accident, then the insurance company should pay out the fair market value of the vehicle on the day of the accident. If your car can be repaired, then the cost to repair the vehicle should be used. Often times, you will only be responsible for the deductible on the repairs and the insurance company will pay the rest. Just as with all the other damages, it is important that you gather receipts for any items you had with you at the time of the accident, and for anything else you will need to estimate the replacement cost of the item. Proving special damages is not typically difficult, but it can take some time and can be tedious. You will need to keep accurate records of each and every bill you incurred as a result of the accident. We recommend that you keep a running log of all expenses you have paid in a log or excel file (click here for a template file that you can use). To come up with a final number, simply add up all previously paid items as well as the cost of any future expenses. This is the total amount of your “special damages”. If you choose to represent yourself, this is the amount you will use when sending a demand letter to the insurance company. To what extent you decide to itemize or lump everything together for the insurance company is a strategic and tactical decision that you should discuss with a personal injury lawyer. The second major category of damages is “general damages”. General damages cannot be easily quantified like special damages. There are no bills or receipts for you to add up and send to the insurance company. That’s because general damages are much more subjective and frequently subject to interpretation given the specific facts of your case. Because these damages are so subjective, you may very well need the help of a personal injury lawyer to assist you in making a calculation of the appropriate “general damages”. We will review each of these one at a time, and then go over how best to prove these damages. This is one of the most common forms of general damages that you may have heard about. Pain and suffering includes the actual “pain and suffering” that you incurred as a result of the accident. There can be past pain and suffering and future pain and suffering. The amount of compensation that you are entitled to for pain and suffering frequently (but not always) will correlate to the amount of medical expenses someone will have. A proper calculation of pain and suffering requires an in-depth analysis of the injuries you suffered and how you suffered them. In North Carolina, a loss of consortium claim is typically brought by the spouse of the injured party and is made up of several parts. The first part is the loss of services that the injured spouse provided to the household (such as cooking, cleaning, caring for children, etc.) The second part is the loss of companionship as a result of the injury, such as the inability of the injured spouse to spend time with the other spouse and attend to normal social activities. The final part of the loss of consortium claim results from a loss of sexual companionship between spouses. Horrifying accidents can often lead to emotional distress on the part of the injured party. These can manifest themselves in the form of ongoing anxiety, panic attics, flashbacks, depression, nightmares, and post traumatic stress disorder. If you find that you are suffering severe emotional distress as a result of your accident, then you likely have a claim for emotional distress. To prove these types of damages, you will need to have documentation from your doctor as well as treatment from a psychologist, psychiatrist, therapist or other mental health provider to substantiate your claim. Proving general damages is much more difficult than simply handing in receipts and asking for reimbursement. These types of damages are highly subjective and dependent on the facts of your case. Frequently, a lawyer will be needed to properly advocate on your behalf the appropriate amount of damages. The most common method of calculating general damages is by multiplying the amount of special damages by a factor from 1 to 5. The appropriate factor that you use will depend on the type and severity of your injuries. In addition, you can research prior jury verdicts in your county to see what types of damages have been awarded in other cases that are similar to yours. This can be a time-consuming and grueling process as you are frequently looking for a needle in a haystack. If your clerk’s office categorizes the personal injury files by type (i.e. car wrecks, slip and falls, etc.) than that will make it easier, but this is still an arduous task. As a final source of information, you can research jury verdicts online through various sources. However, these compilations are frequently expensive and a lawyer would be better suited to do this research for you.